This event is a great family activity for a Saturday morning and provides a chance to catch up with neighbours and friends and to also see what Scouting is doing in the Greenhithe community. 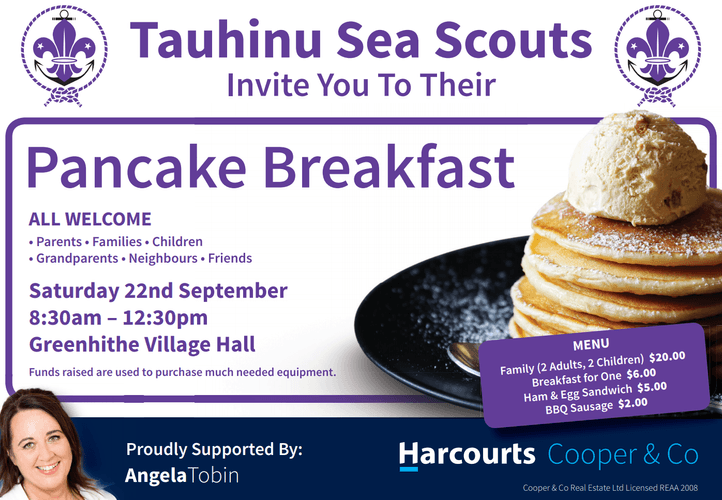 Plus we will have some great raffles provided by our friends at Harcourts, game stalls, silent auctions and you can compete in our annual Pancake Flipping championship. We have more than 25 fantastic silent auction items for you to bid on at the Awesome Sea Scout Pancake Breakfast: health and fitness deals, excursions, entertainment and other “I must have” items for your children, family and friends. Place your bids on a sheet of paper on the morning of the Pancake Breakfast and the highest bid wins.